Ready to retire, refire, reinvent and reinspire? Nestled within the rolling hills of Texas Forest Country, Nacogdoches offers Southern hospitality mixed with a rich history and a moderate climate. Nacogdoches was one of the first three communities in Texas to be recognized as a Certified Retirement Community. This state program recognizes communities that are exemplary in several areas, including housing, safety, working opportunities, healthcare services, transportation, continuing education, recreation, cultural events, sports, community services and spiritual enrichment. 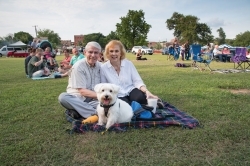 Nacogdoches offers the services and activities retirees demand while retaining the hometown friendliness and natural beauty so many retirees desire. Close proximity to two of the South’s best bass fishing lakes — Sam Rayburn and Toledo Bend — makes Nacogdoches a prime recreation hotspot. Surrounded by abundant lakes and tall pine and hardwood forests, residents of Nacogdoches County have the opportunity to choose from an array of leisure, educational and recreational activities. Nacogdoches is proud to be one of the first Certified Retirement Communities authorized by the State of Texas.